The first time I listened to the Hamilton: An American Musical Original Cast Recording with my kids, they immediately loved the music. But they also had a lot of questions, namely, “Who is Alexander Hamilton and why is everybody singing about him?” When I explained about his life and tragic demise, they wanted to know more, so we did what we always do in that situation…we headed to the library to find books about Alexander Hamilton! Aaron and Alexander: The Most Famous Duel in American History by Don Brown – This picture book was the first about Hamilton that we read, and was probably our favorite. An easy-to-understand retelling about the two men’s lives, combined with gorgeous illustrations. This would be a great read-aloud for kids in Kindergarten and older. Who Was Alexander Hamilton? by Pam Pollack and Meg Belviso — Another great book from the Who Was? series! 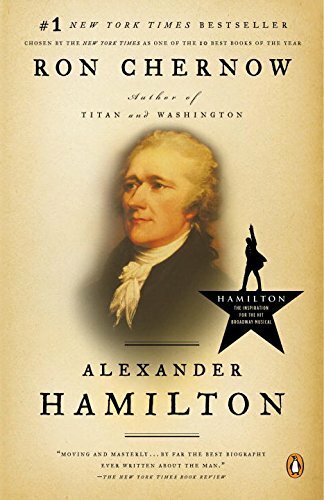 This book is an interesting and kid-friendly look at Hamilton’s life, military service, political career, and untimely death. An excellent read for kids in grades 3 and up. Alexander Hamilton: From Orphan to Founding Father by Monica Kulling — This level 3 early reader focuses on Hamilton’s rise from a young orphan in the Caribbean to one of the most influential politicians of his time. This book draws on key elements from the musical, and is an engaging read for younger kids. It also works as a read-aloud. 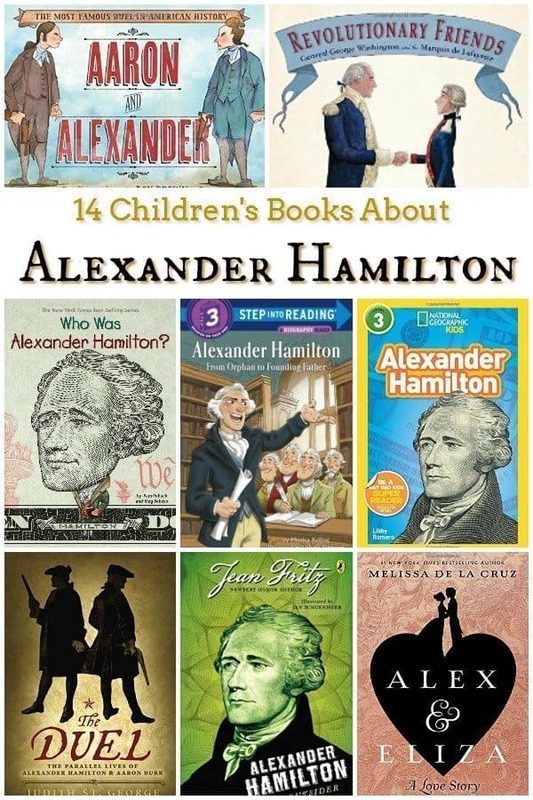 National Geographic Kids Readers: Alexander Hamilton by Libby Romero — Another level 3 early reader, this book dives into Hamilton’s early life and influence on the founding of the United States, with lots of photographs, artwork, and colorful maps. Alex and Eliza: A Love Story by Melissa de la Cruz — I had to include this historical fiction novel by one of my favorite authors. This book follows the love story between young Alexander Hamilton and Eliza Schuyler, and offers a different perspective from the musical. A fun story for middle grade readers. Revolutionary Friends: General George Washington and the Marquis de Lafayette by Selene Castrovilla – While not directly about Alexander Hamilton, this book tells the story of two key players in his life (and in the musical). This is a really interesting look at the friendship between these two men, and it taught me as much as it taught my children. Alexander Hamilton: the Outsider by Jean Fritz – This chapter book is great for upper grade readers who want to learn more about Hamilton. A really comprehensive biography told in a compelling way kids will enjoy. The Duel: The Parallel Lives of Alexander Hamilton and Aaron Burr by Judith St. George – Another great upper grade book that focuses on the similarities between Hamilton and Aaron Burr, and the reasons for their deadly duel. The chapters alternate between the two men, painting a clear picture of how they were alike. Alexander Hamilton #2: Little Lion by Ann Hood – This book from The Treasure Chest series follows a set of twins as they travel back in time with a mission to meet Alexander Hamilton, who is getting ready to board a ship for New York. This story is a fun blend of fiction and non-fiction that kids in grades 3-5 will love. Alexander Hamilton (Jr. Graphic Founding Fathers) by Jane H. Gould – The story of Alexander Hamilton told in graphic novel form! This is a great choice for comic-lovers and kids ages 8 and older. Alexander Hamilton: Young Statesman (Young Patriots series) by Helen Boyd Higgins – This chapter book focuses on Alexander’s childhood and experiences growing up in the Carribean. I would recommend this for kids in fourth grade and older. Alexander Hamilton vs. Aaron Burr: Duel to the Death (History’s Greatest Rivals) by Ellis Roxburgh – Ok, I had to laugh at the title of this one, because it sounds like an action movie. However, this book is legit. It provides a lot of background information about the culture and the time period, and focuses on what would cause these two men to have such a fierce battle. The Alexander Hamilton You Never Knew by James Lincoln Collier – Right away, this title had me interested. This is an excellent character study of Hamilton and what motivated him. Perfect for middle grade readers, this book dives into the man behind the duel. Alexander Hamilton by Ron Chenrow – The book that inspired the musical. An in-depth look at a complex individual to who had so much influence on the formation of our country. Long, but worth it. Hamilton: The Revolution by Lin-Manuel Miranda and Jeremy McCarter – The story of the hit show by the man who created it. An amazing look at how this cultural force came to be. I hope these books help you explore the history of our nation’s founding with your #Hamilkids!